Let's all encourage Dracky to make another comic! If we all close our eyes, think happy thoughts, and tap our heels together, it just might happen! *cough* or we could force dracky to do such a thing. then it will happen! Or.... you guys could take initiative. I mean, why does drack need to do it? I would rather that he would be working on the game in the time he would spend doing a comic. Yeah, I pretty much just quit working on this completely. I'm never gonna make another one again. Ever. And I certainly didn't just post one...ever! I don't know about you guys, but I sure am glad that whole mess is cleared up. then why is there still a forum here for strange breed of human? we won't need it again. ever. seeing as we have all expressed our feeling for the 2 comics already? or we want to make another failing attempt to force dracky to make another one. Hehehe... Thanks Drack. That comic was amazing. I think I'm gonna make me one of them. 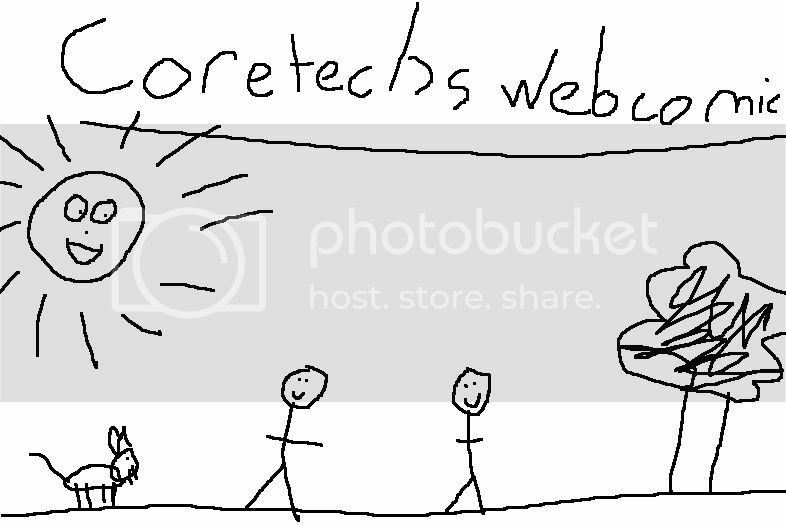 Here Coretechs, if your going to be making comics, I thought that I would design you a sort of "start" or "home" page that you could display. After seeing that, I think it's safe to say I will NEVER make webcomics.